It means "By the hives" and is pronounced "ou ooloo". "U" means "near..." or "by...", hive is "ul", hives are "uly" but "by the hives" is "u ulu". The things above the letters are extremely significant and their omission can radically change the meaning of the words. (I don't use them in the examples because not everyone has Central European fonts installed.) If the ring above the last "u" was omitted, for example, the name would mean "By the hive" (singular). When I programmed text games in the Czech language I ran into enormous problems because Czech words "mutate" according to the context in which they are used. E.g. : "Box" = "krabice". "Boxes" = also "krabice"! "Take the box" = "Vezmi krabici". "Without the box" = "Bez krabice". "Cover it with the box" = "Prikrej to krabici". "Match" = "sirka". "Matches" = "sirky". "Take the matches" = "Vezmi sirky". "Without the matches" = "Bez sirek". "Cover it with the matches" = "Prikrej to sirkami"!!! 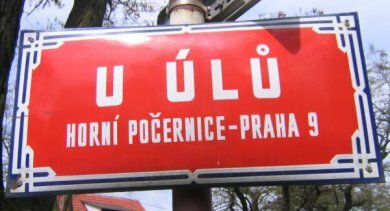 Check out the Wikipedia for more info about the Czech language including the famous "strc prst skrz krk" sentence. you mean "strch prst skrz krk", right? same in Slovak. I found pretty amusing that you use both circle and acute. Funny pronounciation, but...I can imagine many children of Horni pocernice didn´t even know what hive looks like. I'm just wondering if there are actually any non-Czechs (or -Slovaks) reading this blog.